The main task of the internet is to provide services to users. For example, users want to run different application programs at the remote site and transfers a result to the local site. This requires a client-server program such as FTP, SMTP. But this would not allow us to create a specific program for each demand. The better solution is to provide a general client-server program that lets the user access any application program on a remote computer. Therefore, a program that allows a user to log on to a remote computer. A popular client-server program Telnet is used to meet such demands. Telnet is an abbreviation for Terminal Network. Telnet provides a connection to the remote computer in such a way that a local terminal appears to be at the remote side. When a user logs into a local computer, then it is known as local login. When the workstation running terminal emulator, the keystrokes entered by the user are accepted by the terminal driver. 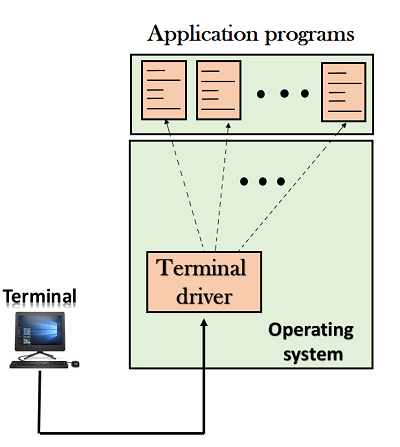 The terminal driver then passes these characters to the operating system which in turn, invokes the desired application program. However, the operating system has special meaning to special characters. For example, in UNIX some combination of characters have special meanings such as control character with "z" means suspend. Such situations do not create any problem as the terminal driver knows the meaning of such characters. But, it can cause the problems in remote login. When the user wants to access an application program on a remote computer, then the user must perform remote login. The commands in NVT forms are transmitted to the TCP/IP at the remote machine. Here, the characters are delivered to the operating system and then pass to the TELNET server. The TELNET server transforms the characters which can be understandable by a remote computer. However, the characters cannot be directly passed to the operating system as a remote operating system does not receive the characters from the TELNET server. Therefore it requires some piece of software that can accept the characters from the TELNET server. The operating system then passes these characters to the appropriate application program. The network virtual terminal is an interface that defines how data and commands are sent across the network. In today's world, systems are heterogeneous. For example, the operating system accepts a special combination of characters such as end-of-file token running a DOS operating system ctrl+z while the token running a UNIX operating system is ctrl+d. TELNET solves this issue by defining a universal interface known as network virtual interface. The TELNET client translates the characters that come from the local terminal into NVT form and then delivers them to the network. The Telnet server then translates the data from NVT form into a form which can be understandable by a remote computer.